This is a very difficult review to write, but one of my resolutions this year was to not shy away from expressing opinions other than those 100% happy and giddy and overwhelmingly positive. I think women, humans, are conditioned to put a happy face on things. I don’t want to hurt anyone’s feelings, but I also have some conflicting feelings about some of the books I read, and so I’ve turned over a new leaf and have started expressing those feelings in my reviews, as a stepping stone for that mindset carrying over into the rest of my life, where I can express other conflicting feelings. That said, I really REALLY wanted to give this book unequivocal 5 stars. Sadly, it hit at only about a 3.5 for me. This book was everything it promised to be: laugh-out-loud funny, occasionally uncomfortable, and a memoir of a woman battling with some severe mental illnesses as well as physical maladies. On one hand, it totally delivered. On the other hand, it needed better editing. It was about 20% too long. There were only so many times that I needed to read the same basic premise with a different metaphor. Yes, we are all fucked up in our own individual ways, but we’re a whole tribe of people fucked up uniquely, and therefore we are not alone. As laudable as that is, as helpful as I’m sure it is for a lot of people, you’re beating a dead horse at some point when that becomes the de facto summation of almost every chapter. The reason the first book worked so well was due to Jenny Lawson’s storytelling. First, she’s hilarious and a good writer in the way she sets the scene and uses description language and smooth sentence structure that carries the story. Second, absolutely ridiculous things seem to happen around her every day. I wanted a lot less therapy and self-help exposition and a lot more story out of this book, and unfortunately that ratio was a little too tipped toward metaphors for what’s wrong with us and why we do the things we do but it’ll come out alright in the end because we’re all special snowflakes deserving of love and of someone to help us, be that our beleaguered families or health professionals. A better editor could have made that scale tip in the other direction, which, in my humble opinion, would have made for a more engaging book overall. And, a better editor or overall publisher would have put some actual helpful information in the book! It’s a book about mental health, for goodness sake! About depression and suicidal thoughts and rheumatoid arthritis and self-harm, etc. How about we add a page of helpful numbers or websites? Hell, if you cut that 20% I mentioned, you could add on an entire chapter of country-specific resources! Jenny actually mentions calling hotlines when she’s needed them. Where are the hotline numbers for those reading the book? A list of hotline numbers wouldn’t be out of place here, and I say that because while reading this book made me laugh, it also made me sad. It made me relive some of my own dark moments. It made me fear the next ones. It made me review my own network of resources and reach out to the people I rely on and do some journaling about my own thoughts and feelings. If it made me feel those things, and if we’re a community of people who relate to Jenny, it stands to reason that other people might also be feeling similar but different things while they read this book, too. And so I believe this book has a small bit of responsibility in sharing those numbers and websites and whatever other resources with its readers. Now, I did read the ebook version, so perhaps they’re in the printed book? Though the ebook should have them also, if that’s the case. Either way, I believe that to be a huge oversight. So while I’m proud of Jenny for having finished this book and I’m grateful to her for doing what she’s doing to bring people together and ease stigma around mental illness, this book was only a 3.5 out of 5 for me. 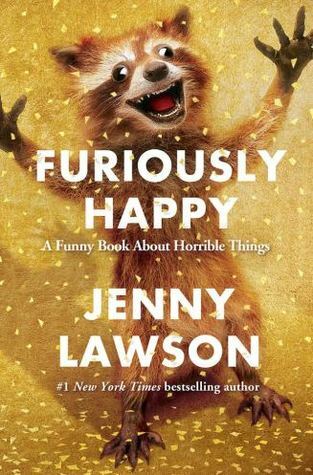 Posted on October 27, 2015 July 30, 2016 by WildlyLivedPosted in Series: book reviewTagged book, books, funny, furiously happy, Genre: adult book, jenny lawson, memoir, reading, Series: book review, the bloggess. Next Next post: Fortunately, The Milk Coming to the Screen! I’m glad you enjoyed it, but I wish it could’ve been a 5/5 for you! Me too! I was so thrilled when it became available on the library queue right as I was taking off for New Zealand. 😦 Sadly it just didn’t live up. Did you read it? I hope your experience is/was more satisfying!